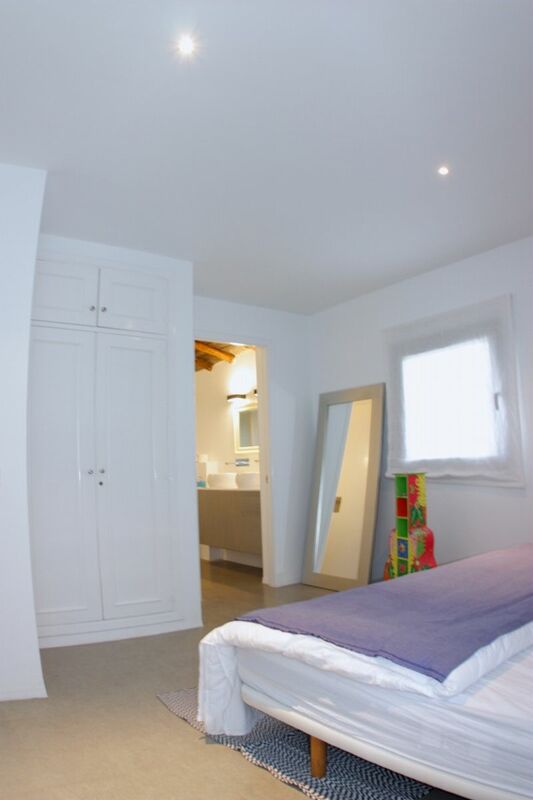 Linen/towel change - twice per week. 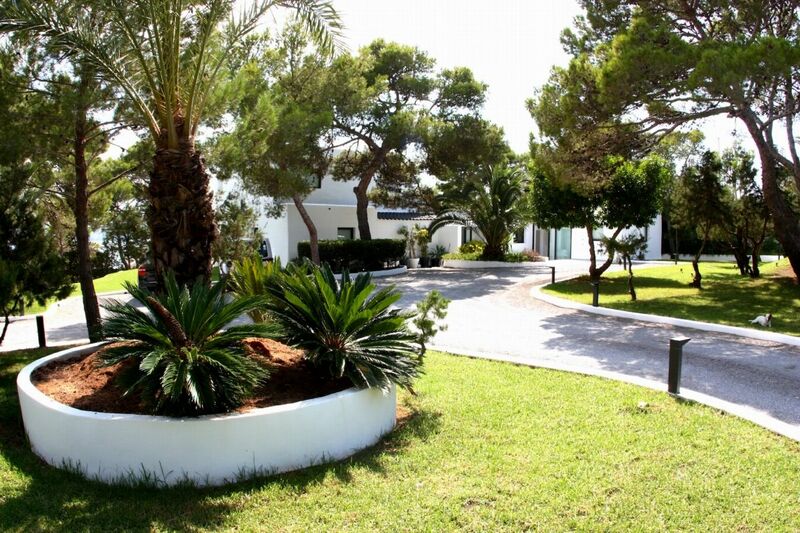 3 hours daily outdoor maintenance. 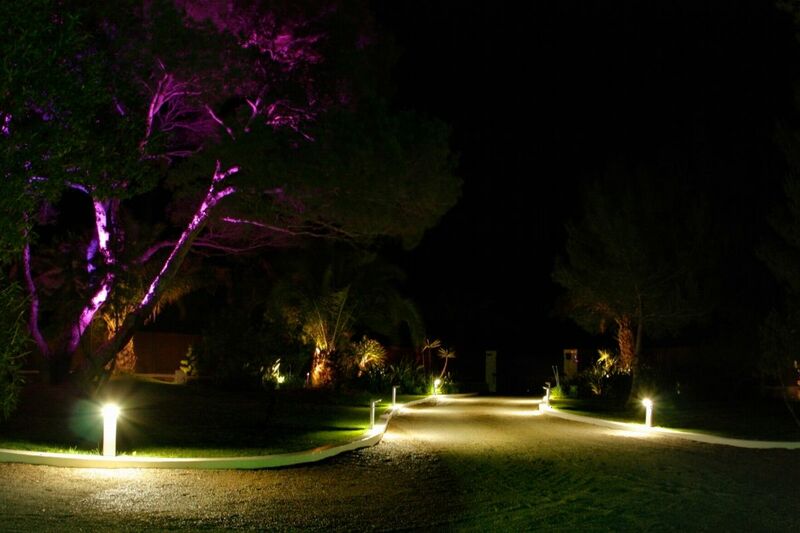 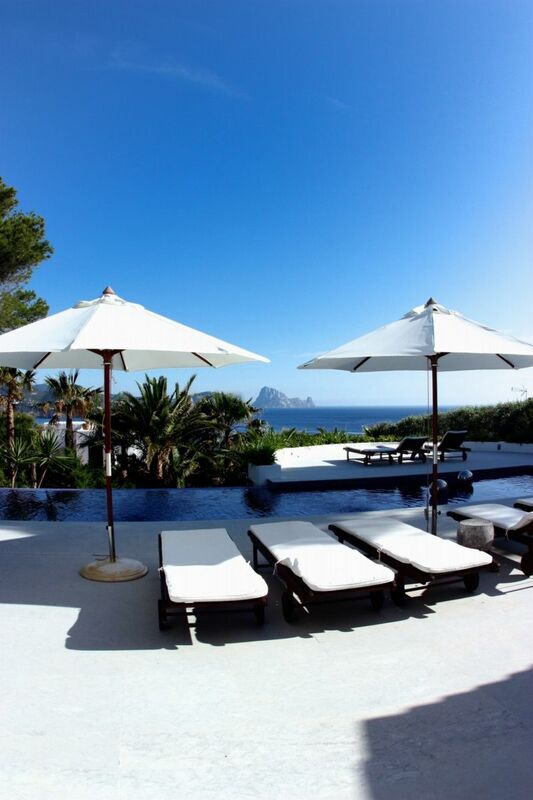 Es Vedra, has long held a legendary place in Ibizan folklore. 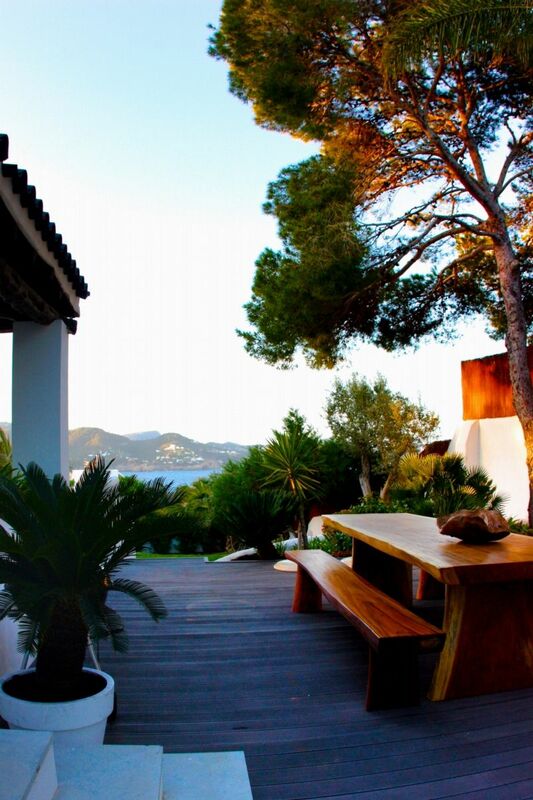 And itâ€™s not hard to appreciate the magic of this place as you gaze across the pink and coral hued Balearic Sea under a gilded Ibizan sunset. 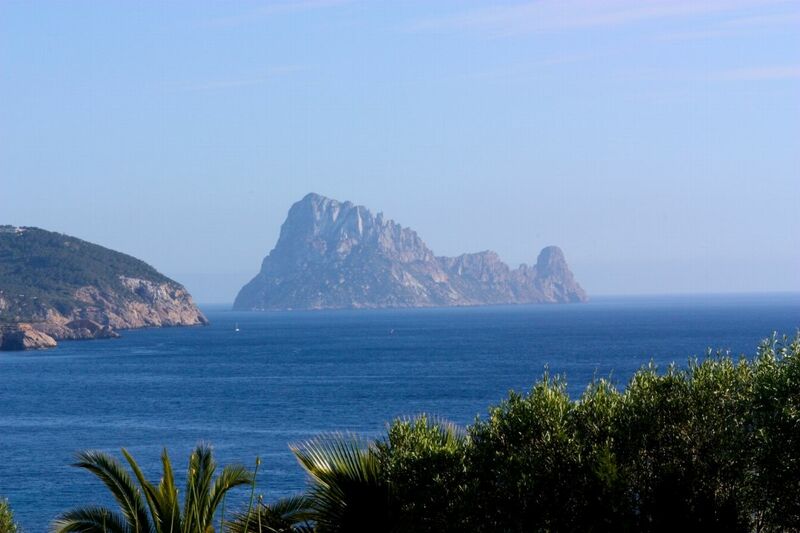 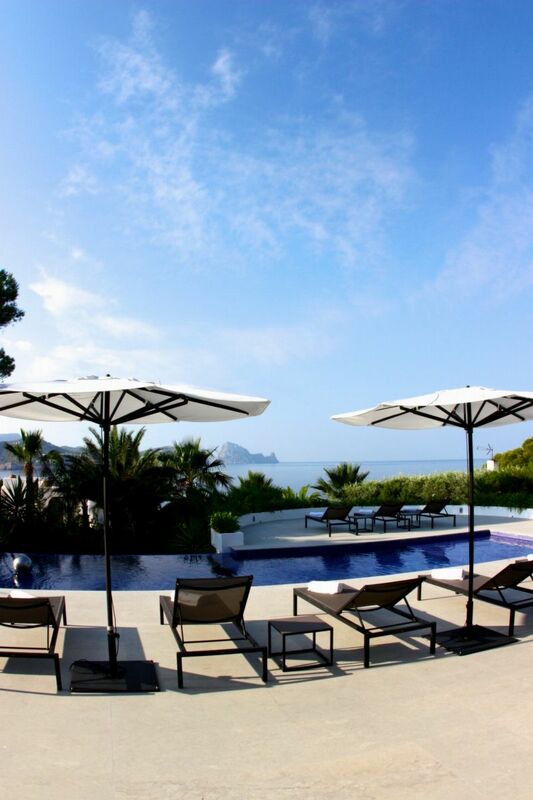 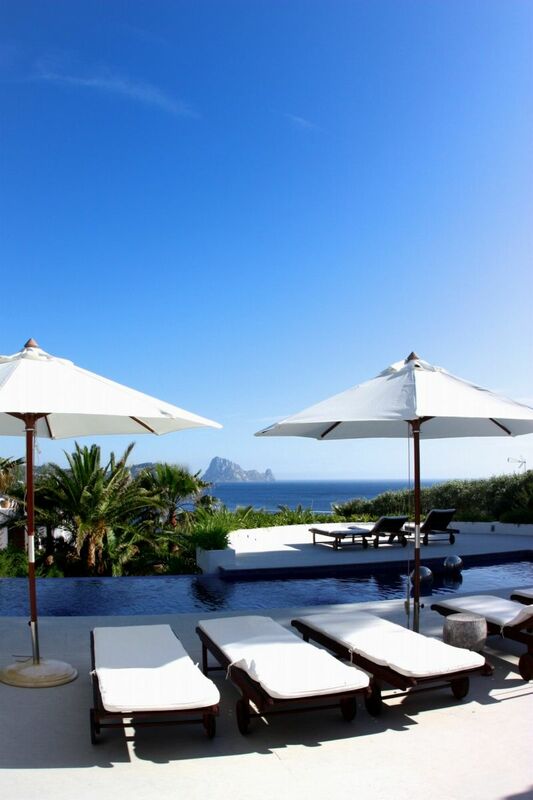 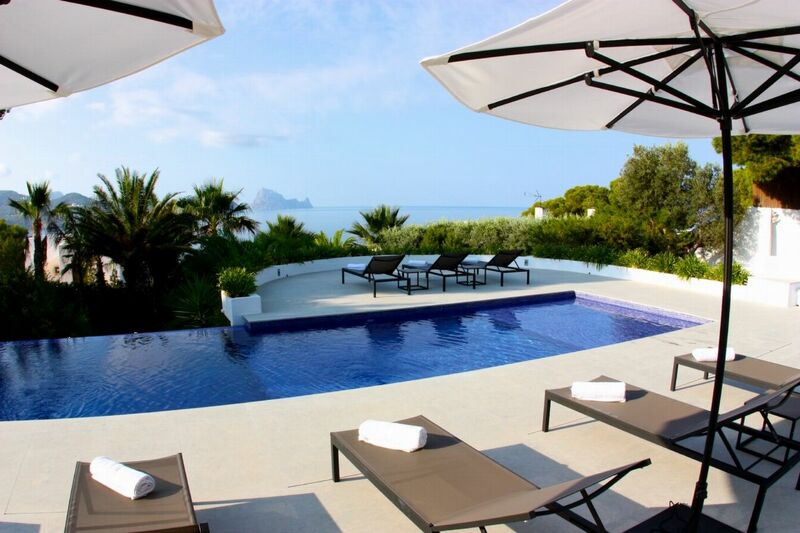 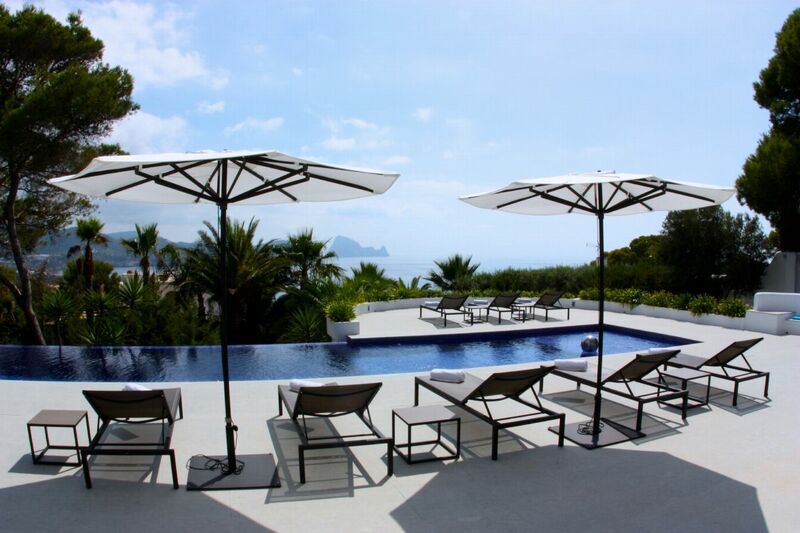 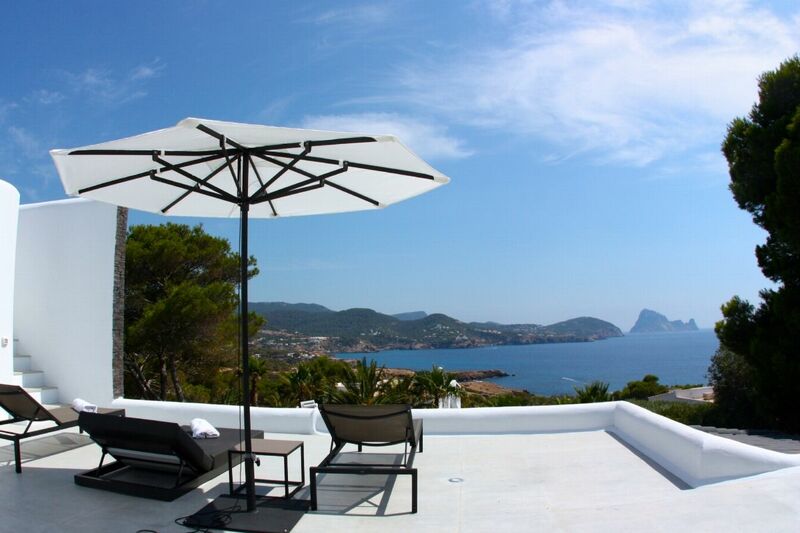 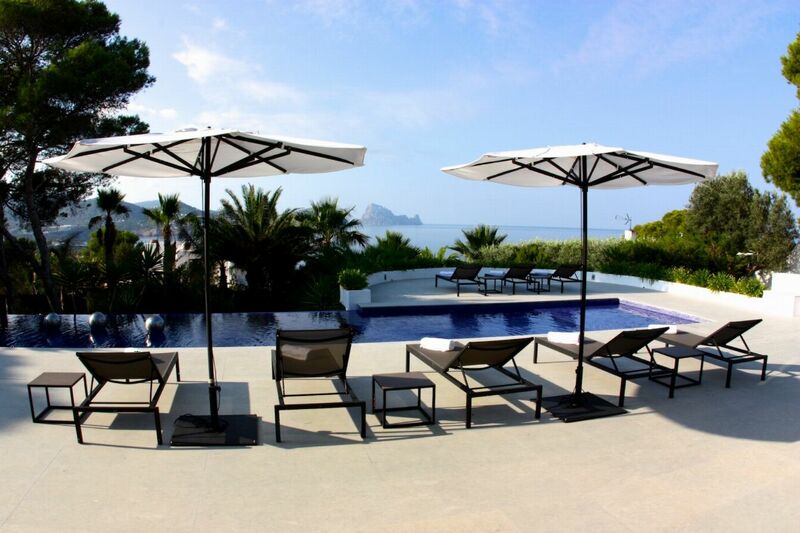 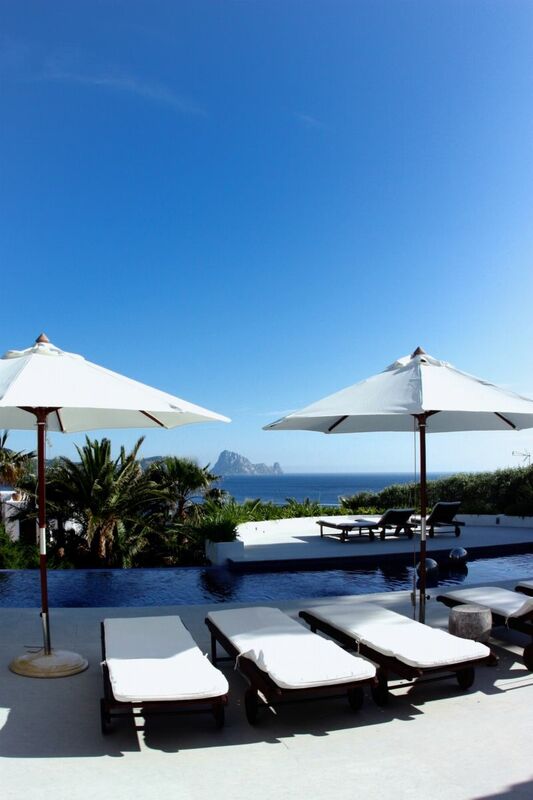 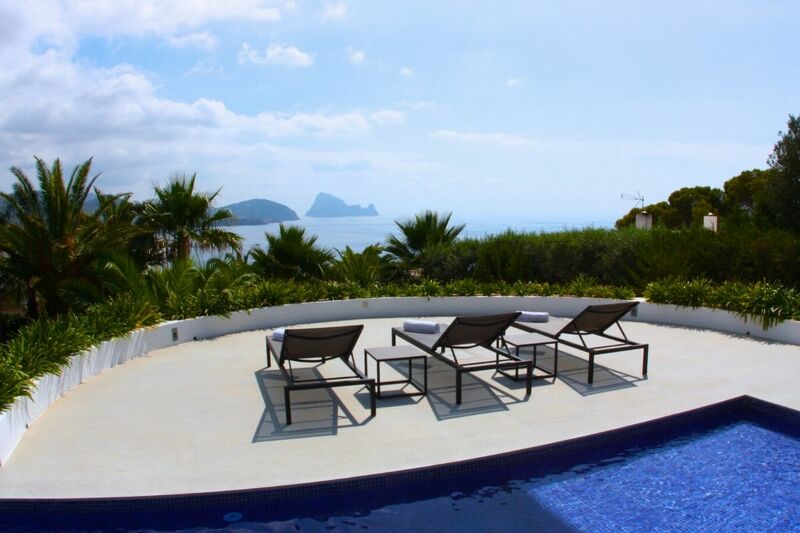 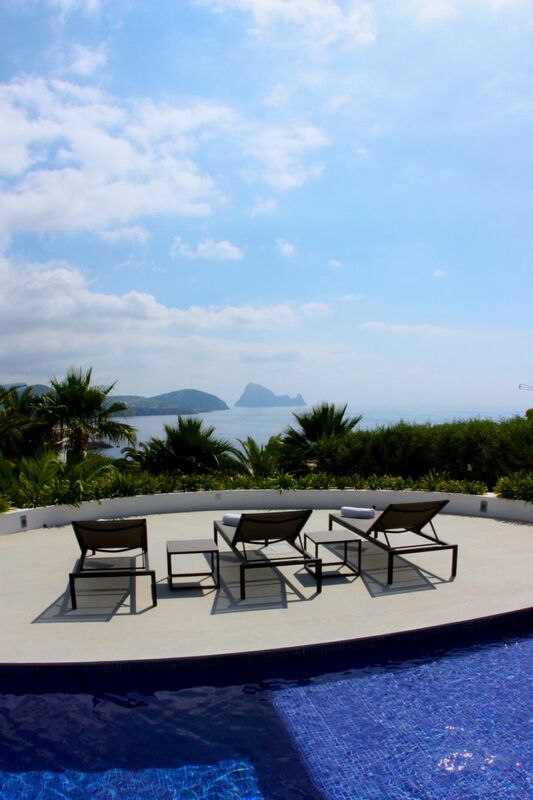 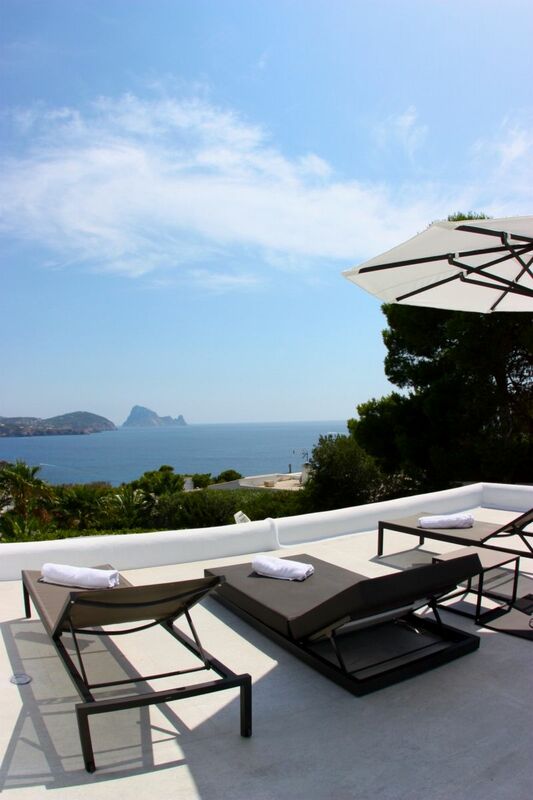 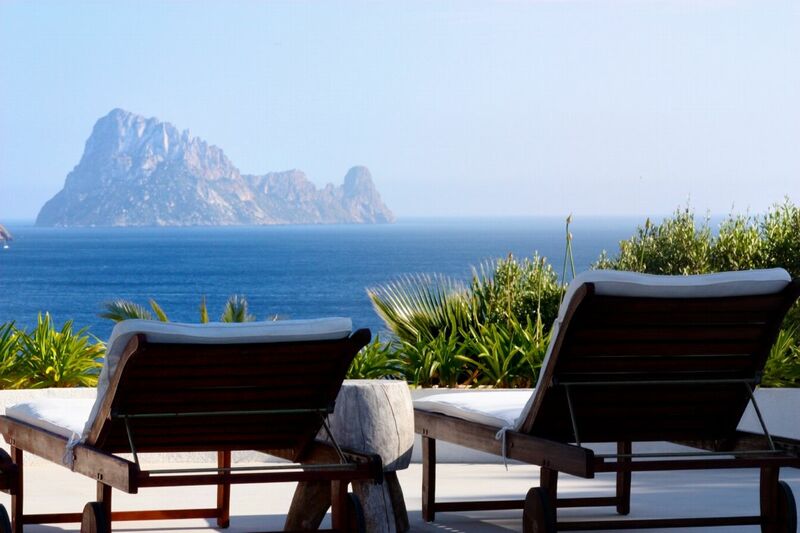 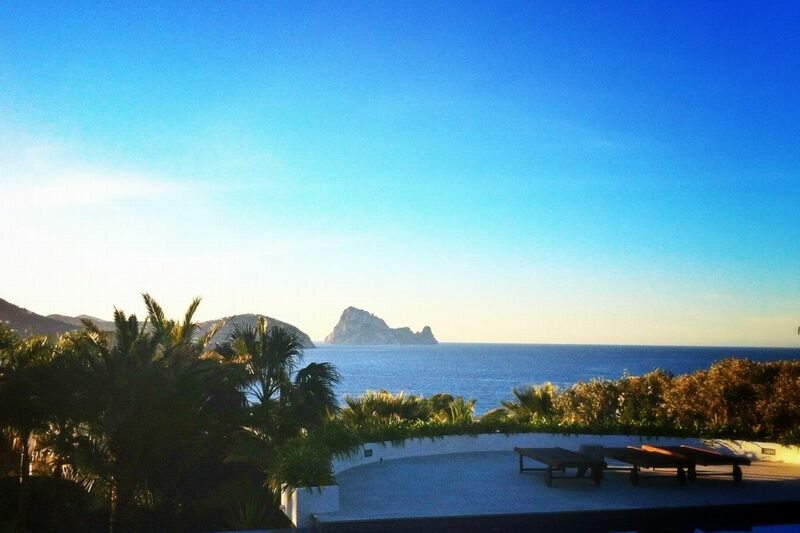 So, imagine enjoying this wonderful view from your own private terrace at Es Vedra Style. 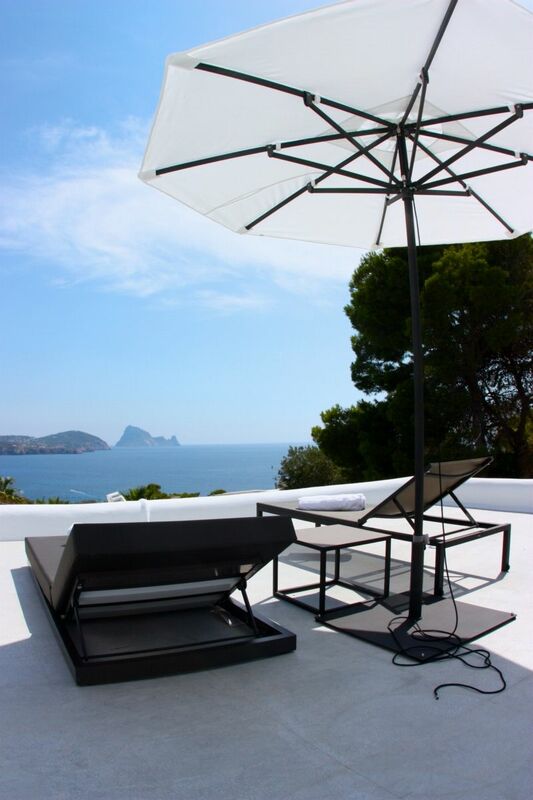 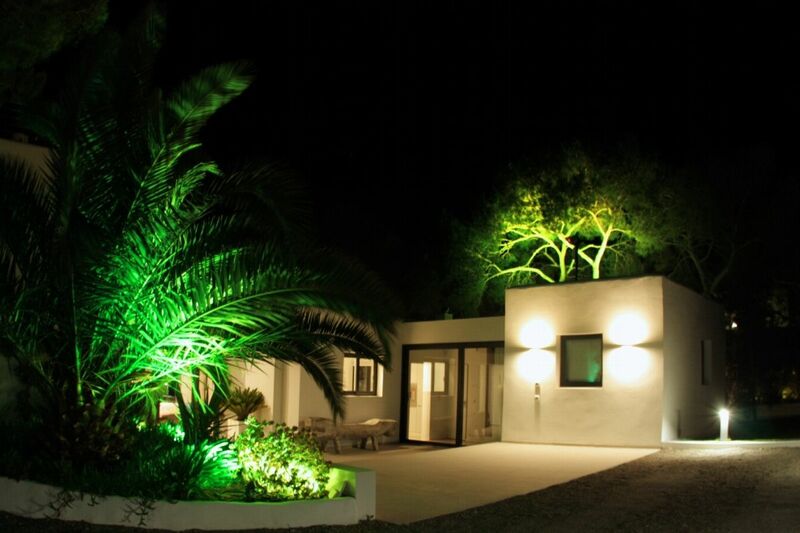 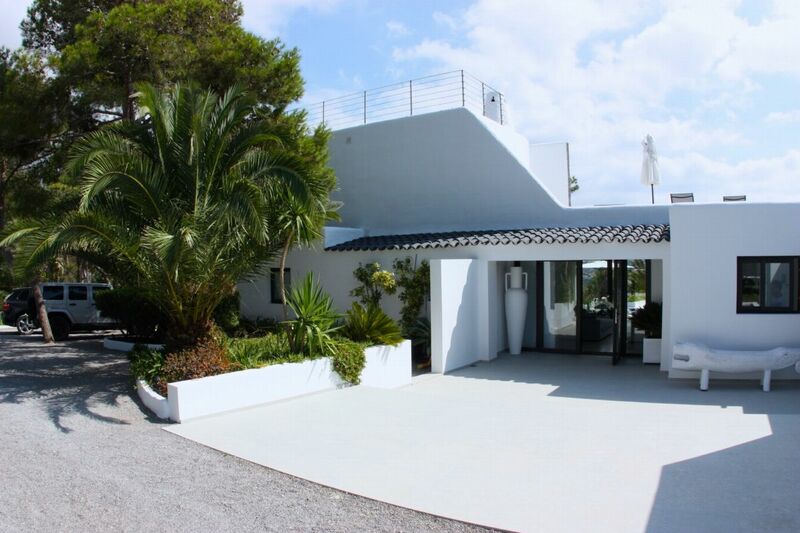 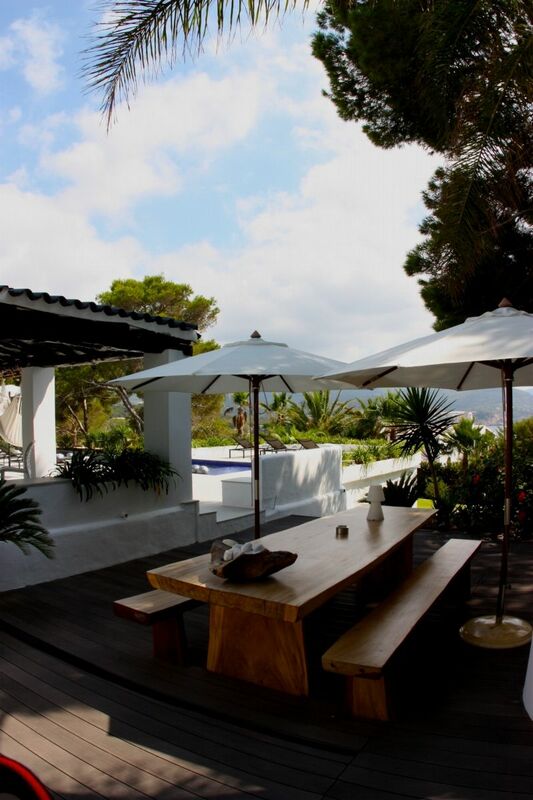 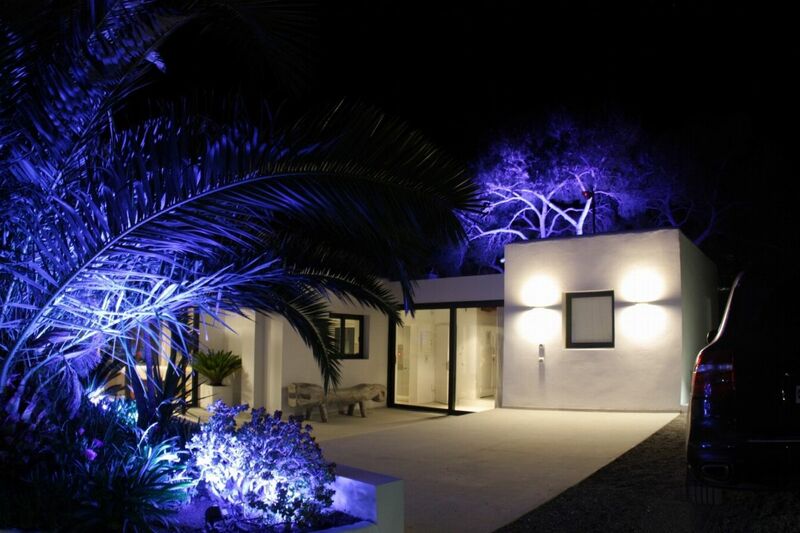 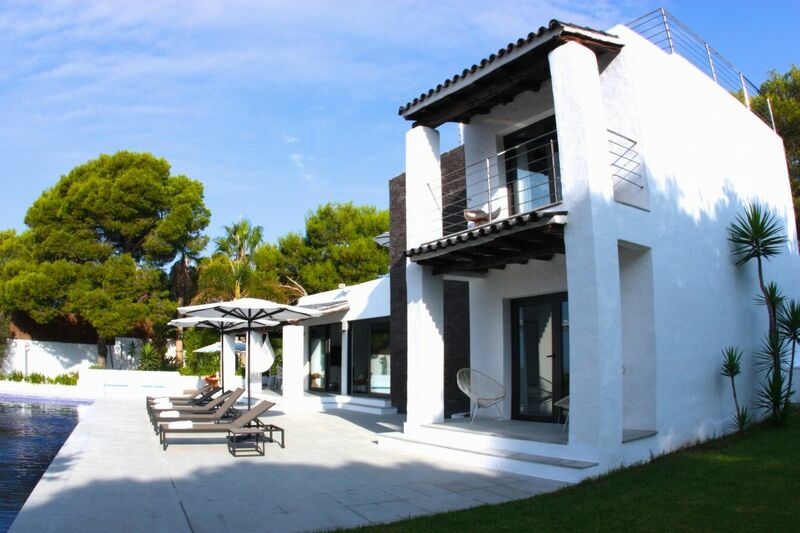 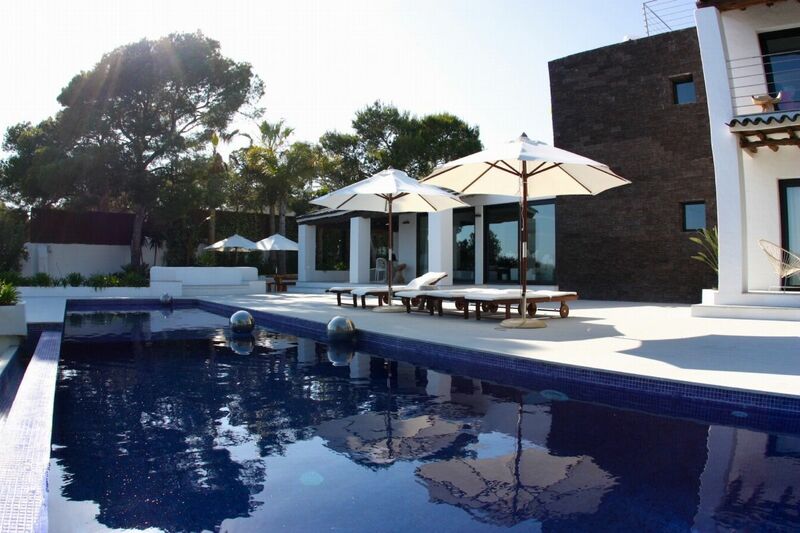 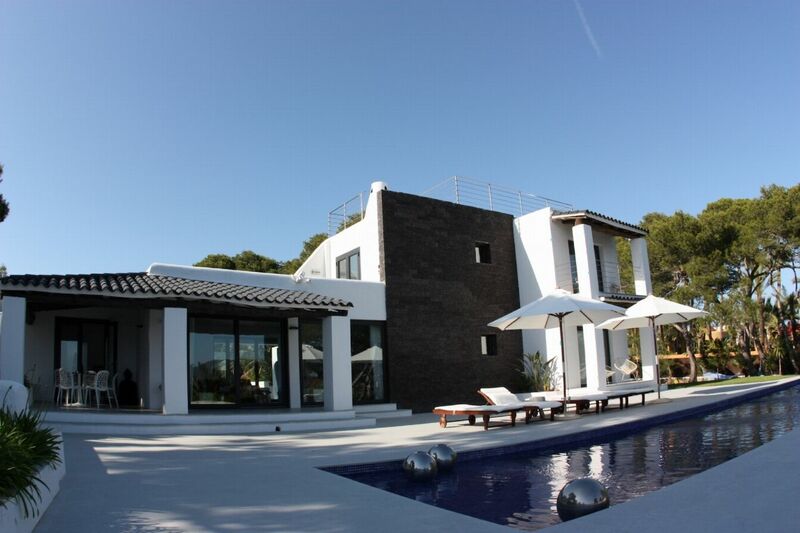 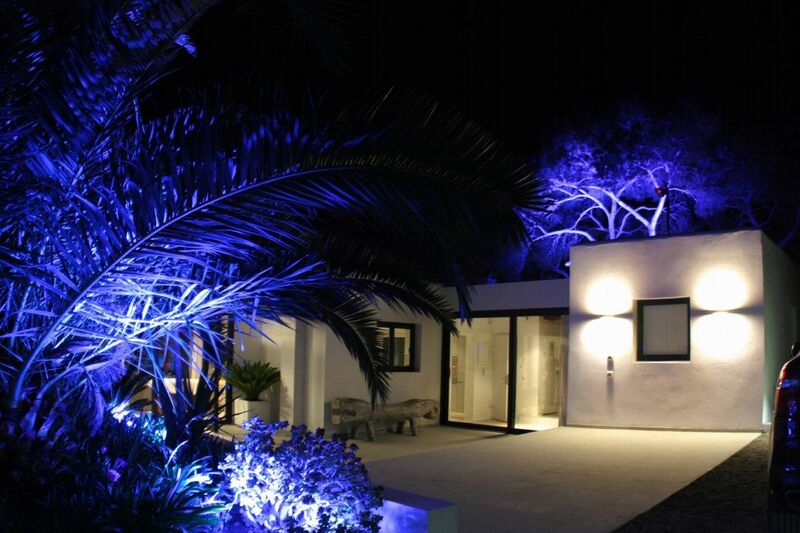 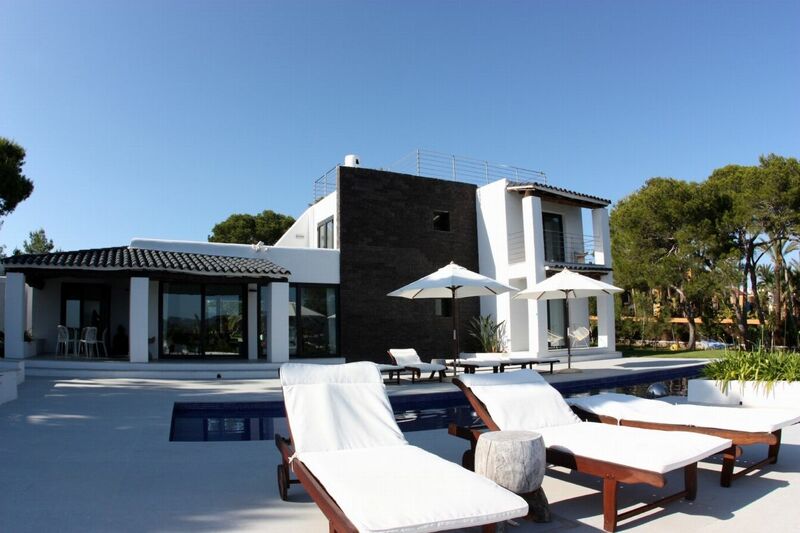 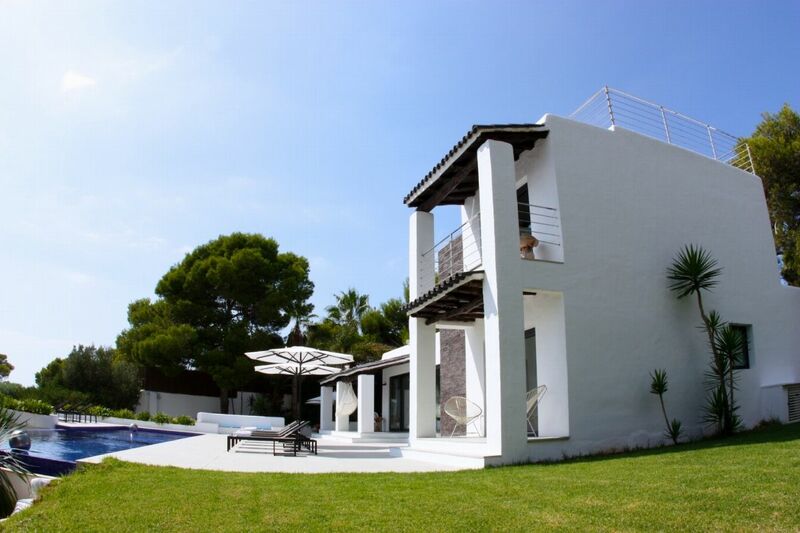 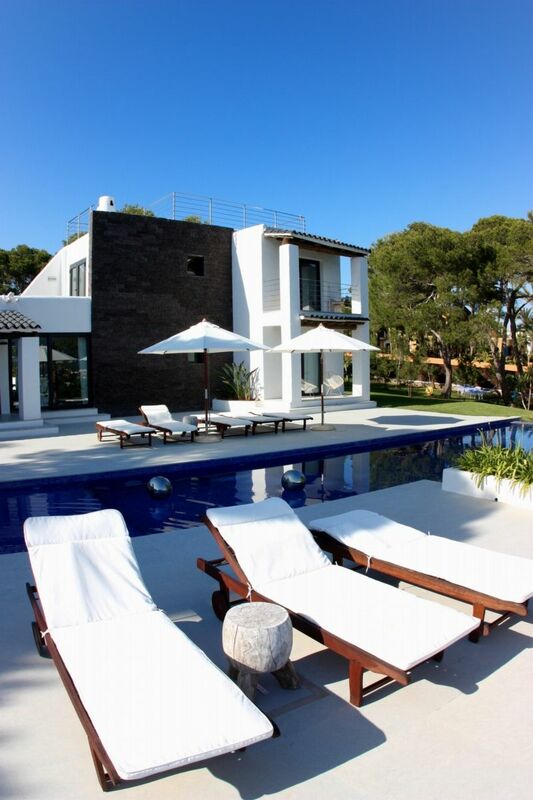 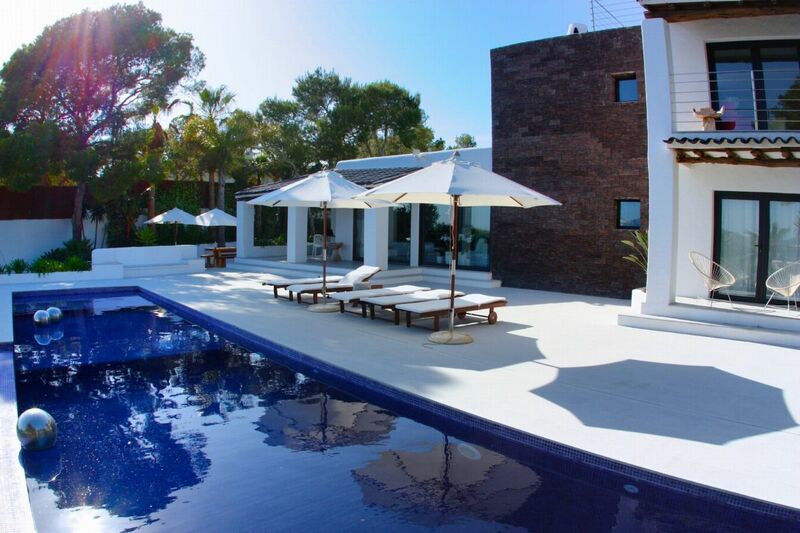 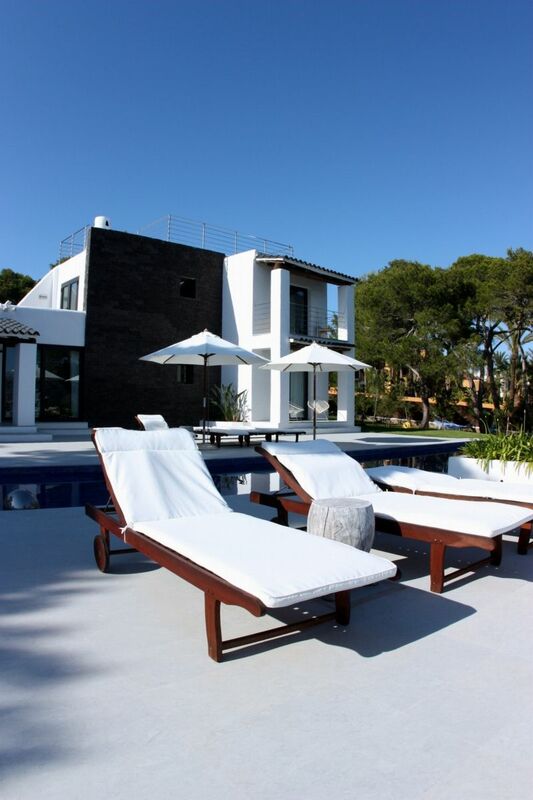 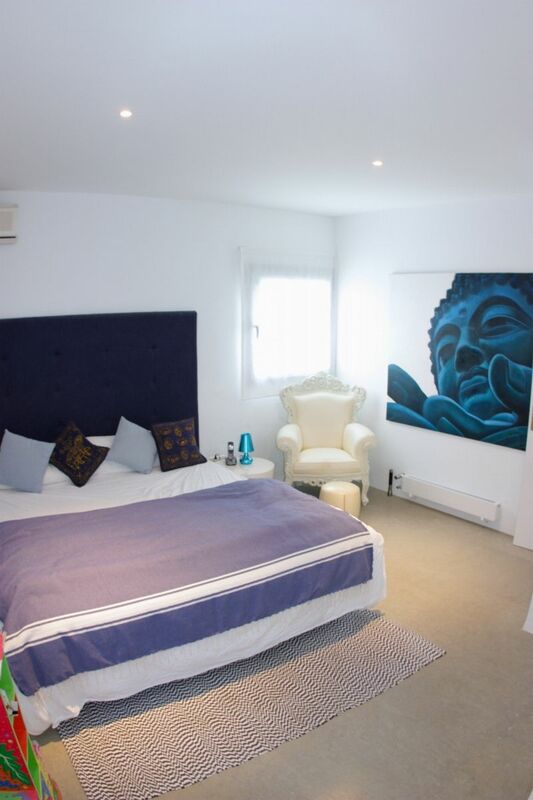 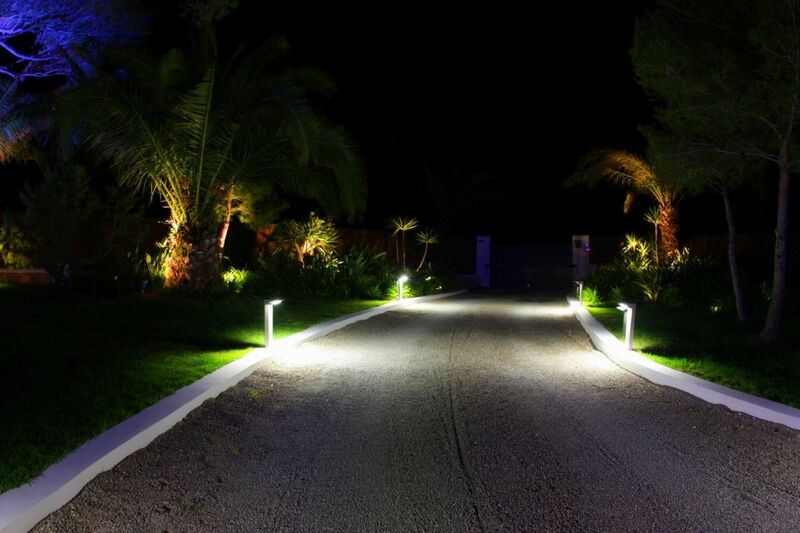 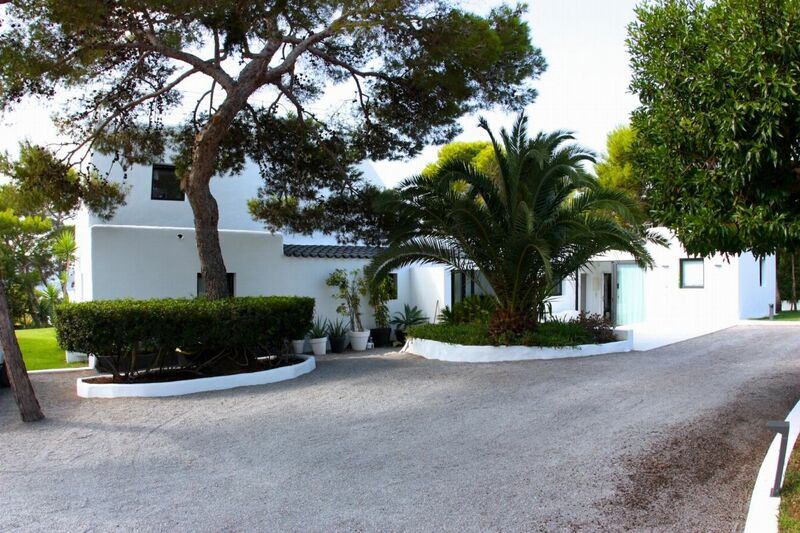 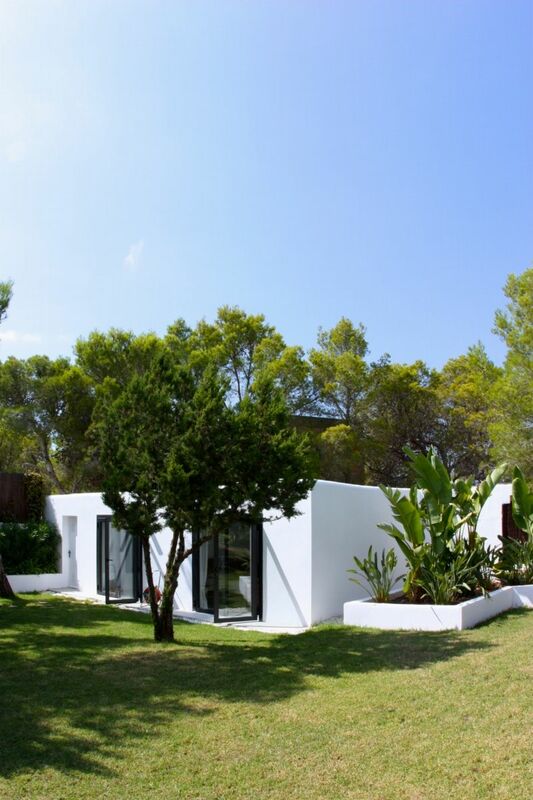 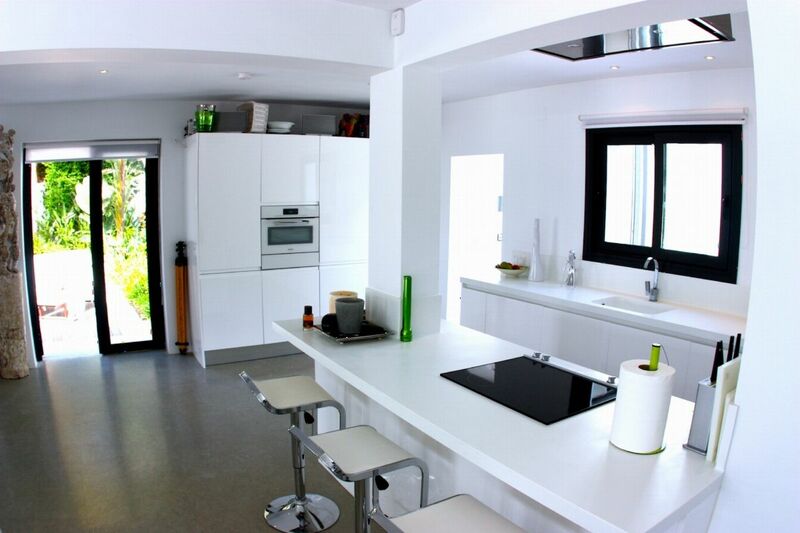 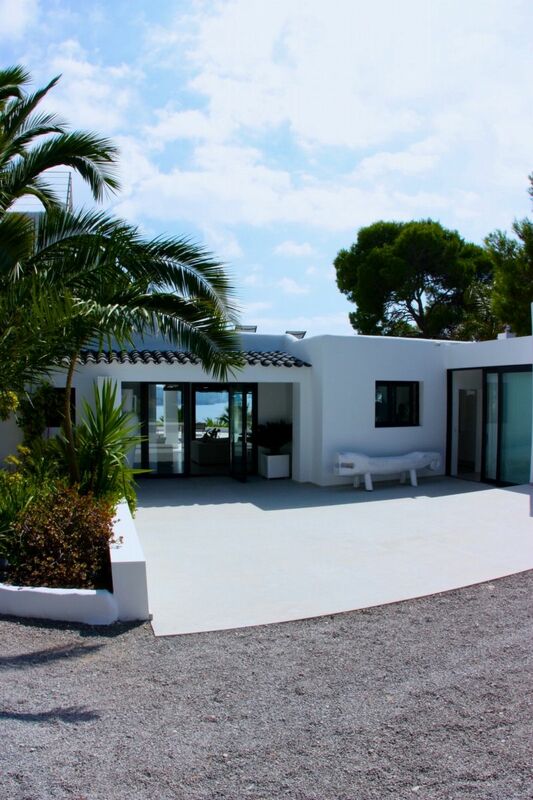 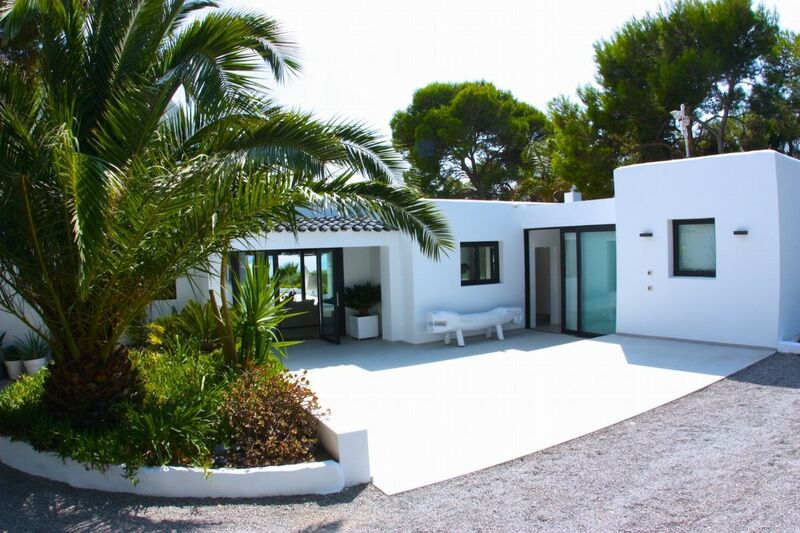 This stylish Ibizan holiday home enjoys a wonderful location on Ibizaâ€™s west coast, just 250 metres away from the sparkling sea, some of Ibizaâ€™s best secluded beaches are within walking distance, making it ideal for enjoying these picturesque beaches and their famed sunsets. 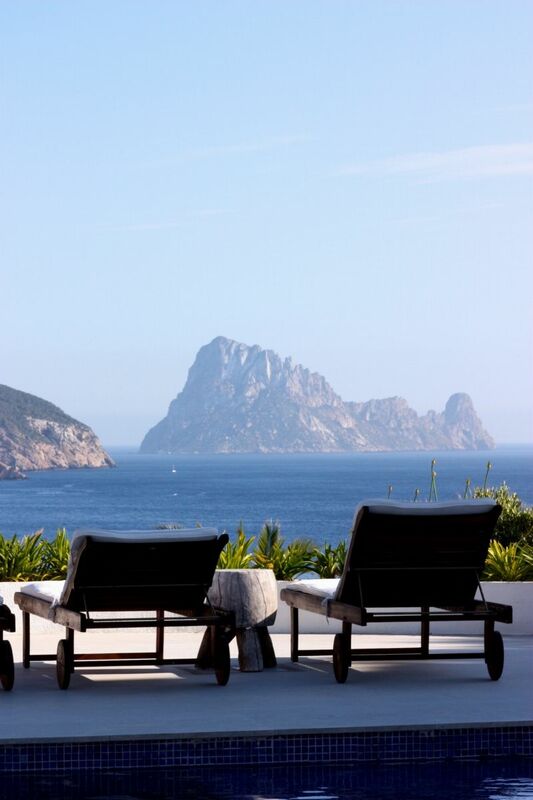 Pull up a lounger on the poolside terrace and you can while away hours gazing across sparkling Mediterranean Sea to the myth-infused isle of Es Vedra. 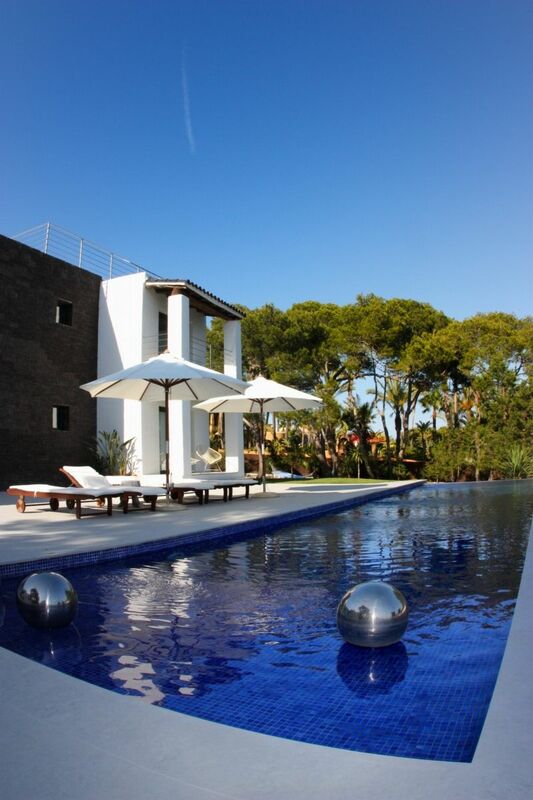 Then, when youâ€™ve soaked up enough Ibizan sunshine, cool off in the 13m x 3.5m pool which stretches the width of this property. 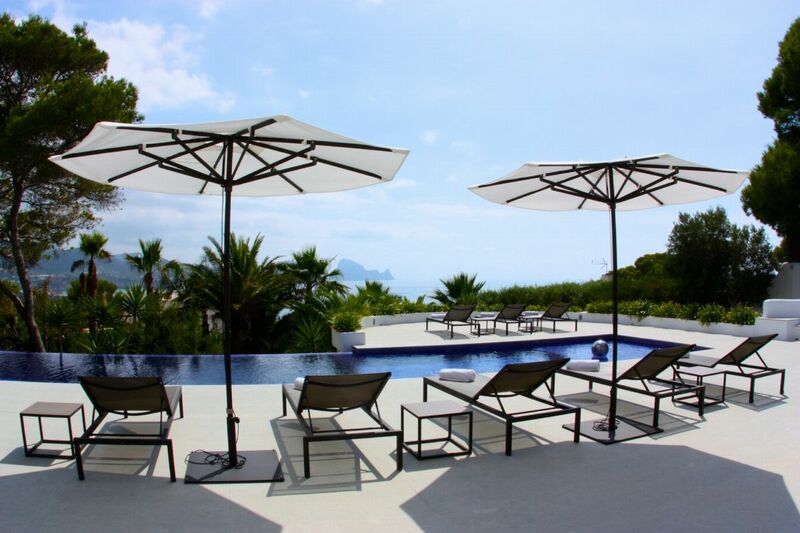 Beyond the sparkling pool, there are palm-lined lawns for your little ones to play on, wide terraces where you can relax in the shade, or enjoy an al-fresco meal with friends. 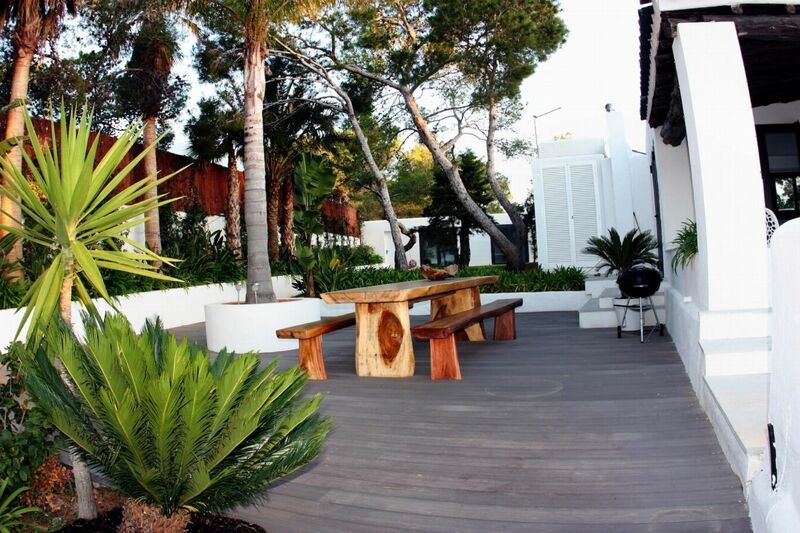 To the side of the house, a wooden deck creates the perfect barbeque area, with a further al-fresco dining space, seating ten; ideal for entertaining. 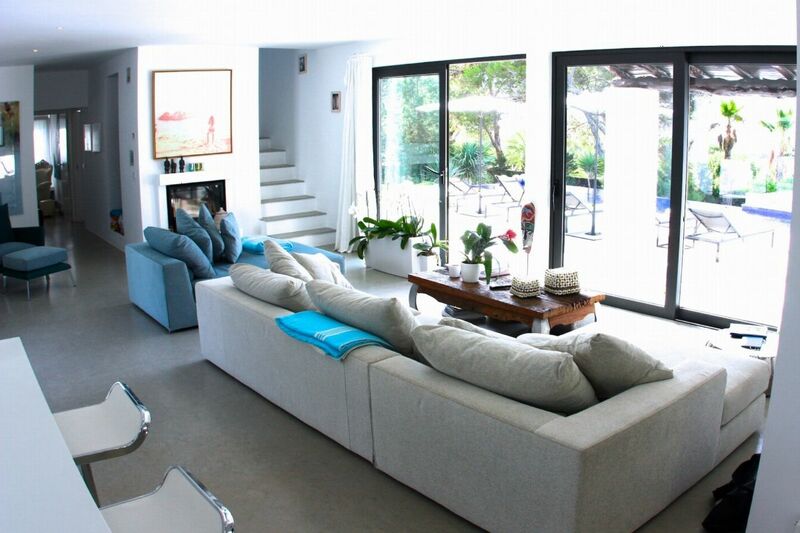 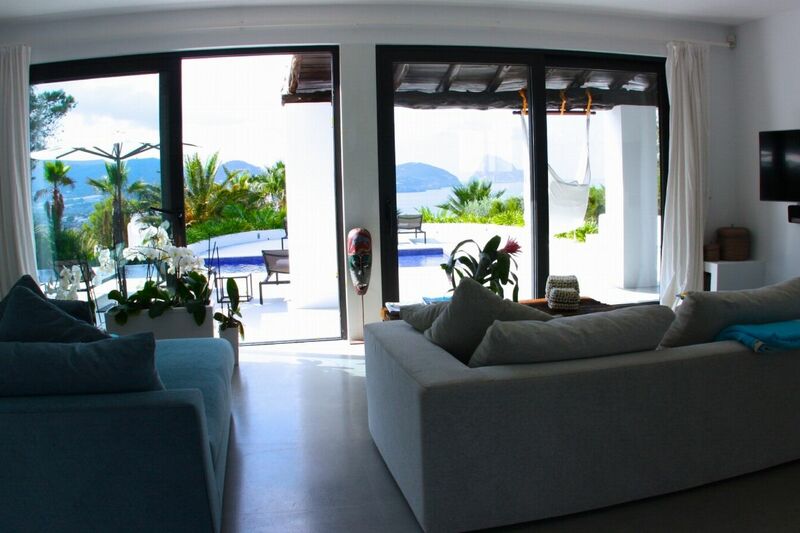 Inside, the modern interiors of white walls and polished concrete floors are softened by the plush furnishings, bright pops of colours and the magnificent pool and sea views. 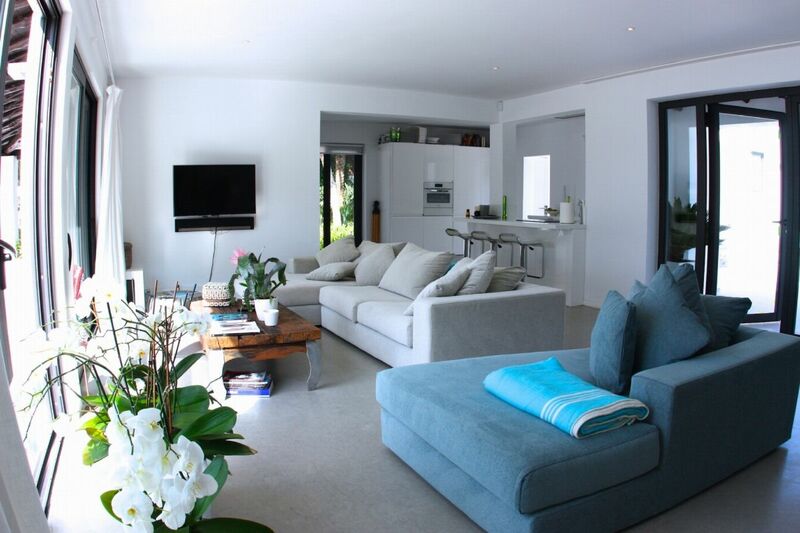 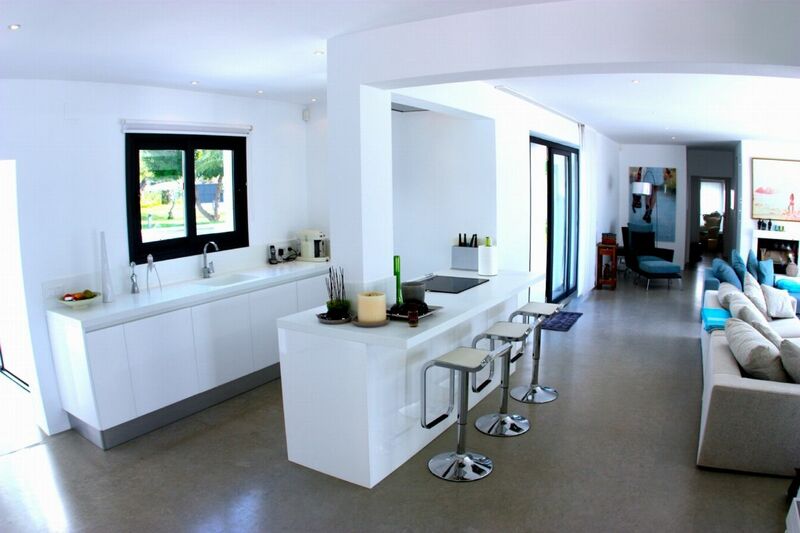 A cosy lounge is open plan to a pristine kitchen, with breakfast bar seating three, and garden views. 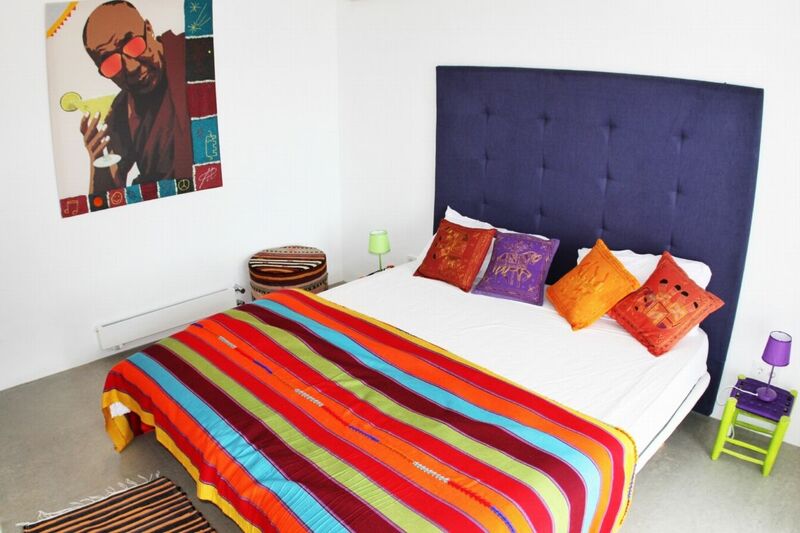 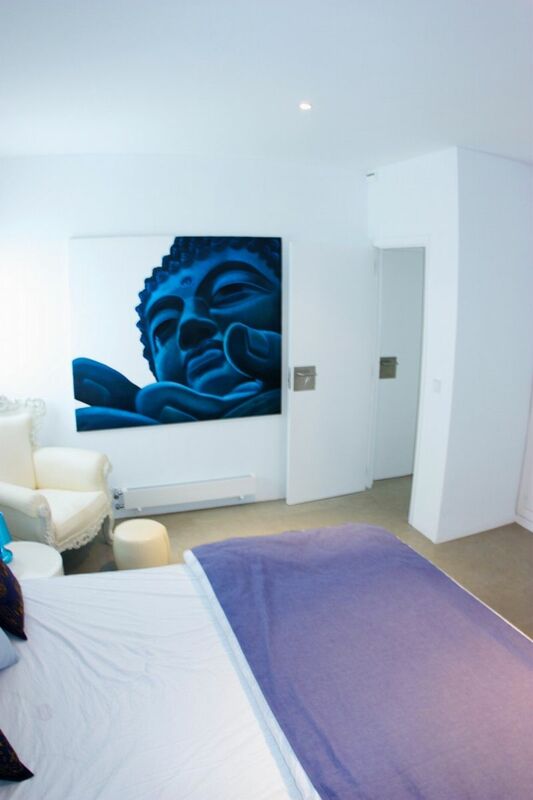 The combination of sleek polished concrete and white washed walls with colourful furnishings and artworks continues throughout each of the six bedrooms. 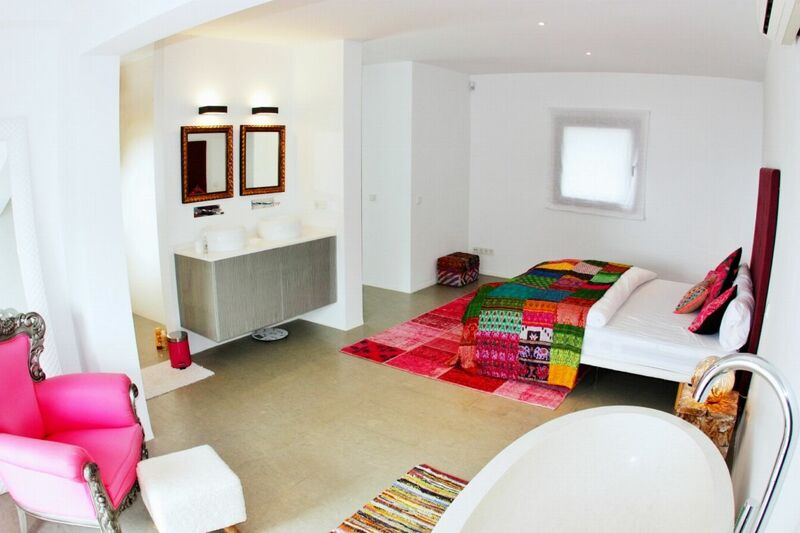 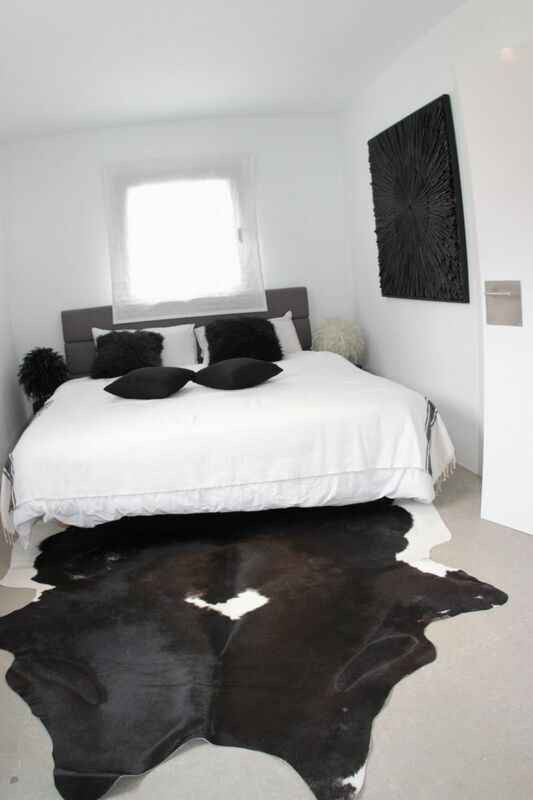 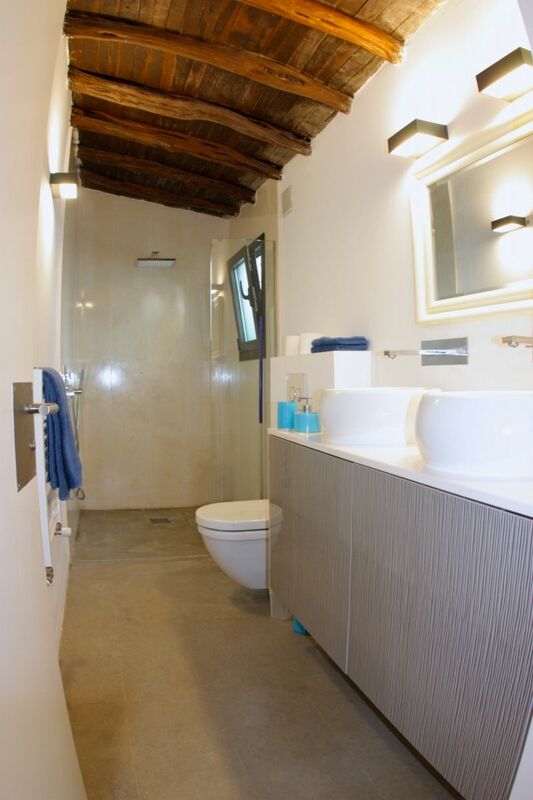 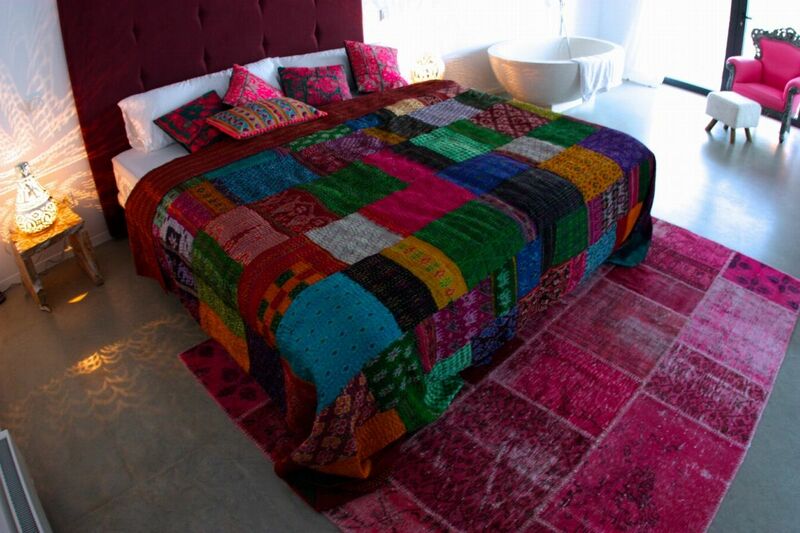 The four in the main house all boast contemporary en-suite bathrooms. 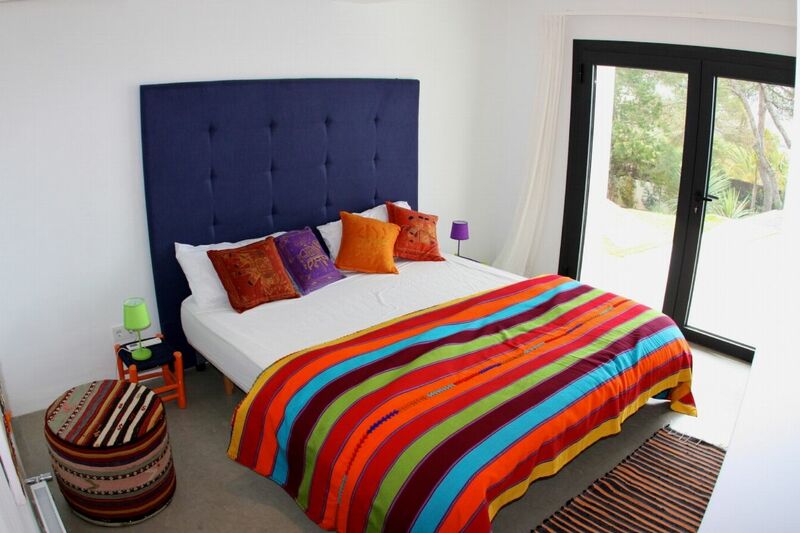 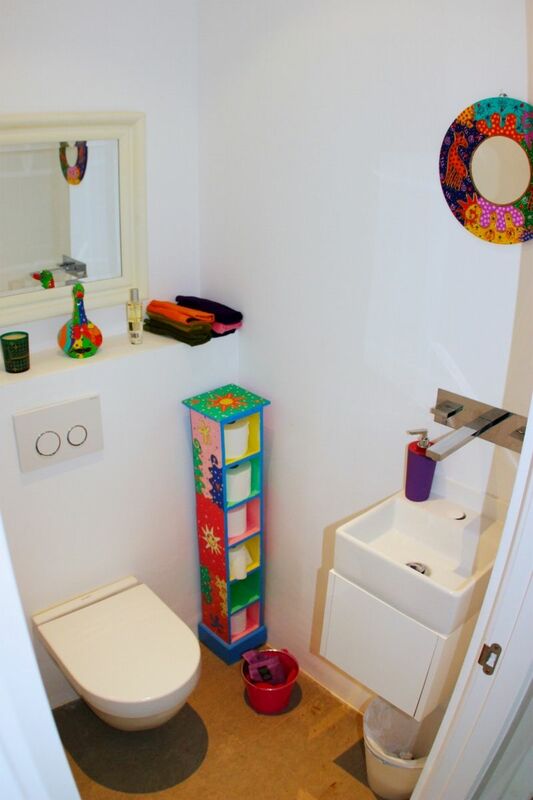 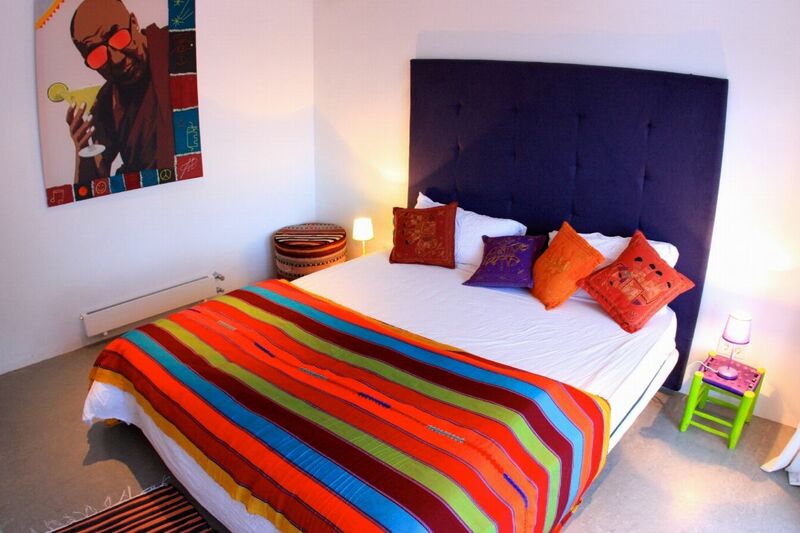 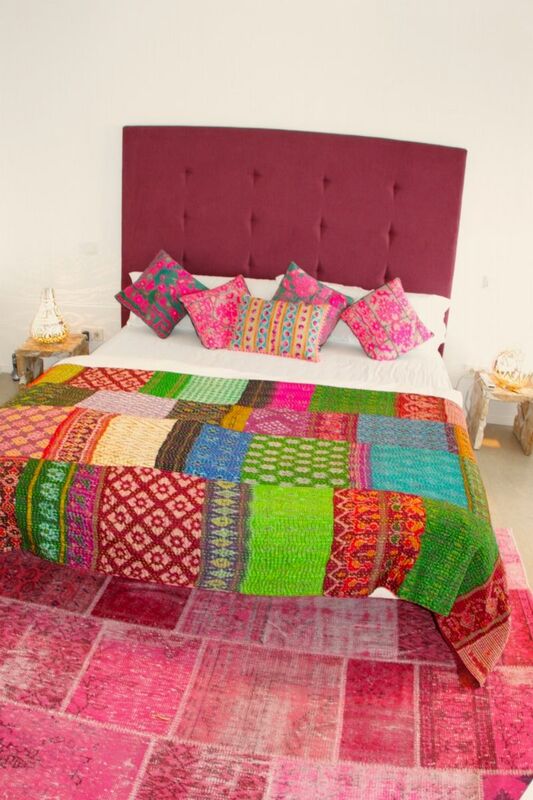 A further two double guest rooms can be found in the guest house with a shared bathroom. 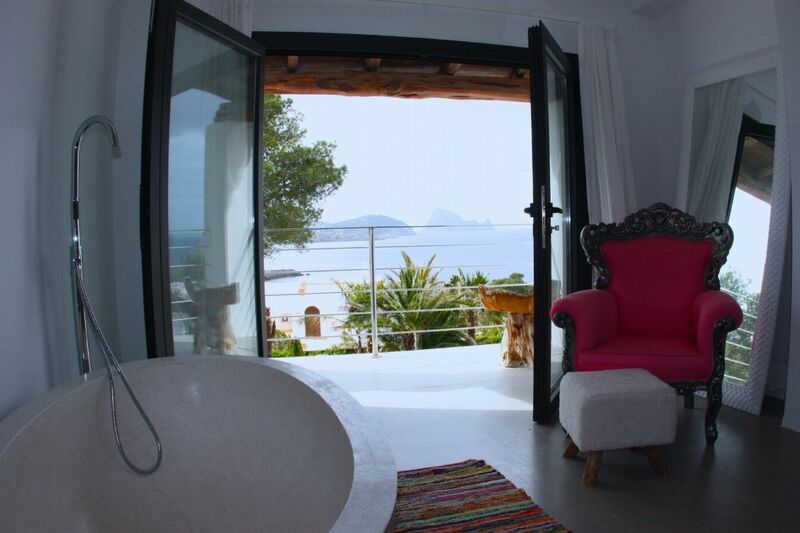 It is the view across the sunny terrace from the freestanding bathtub in the master bedroom on the upper floor that really captures the magic of this property. 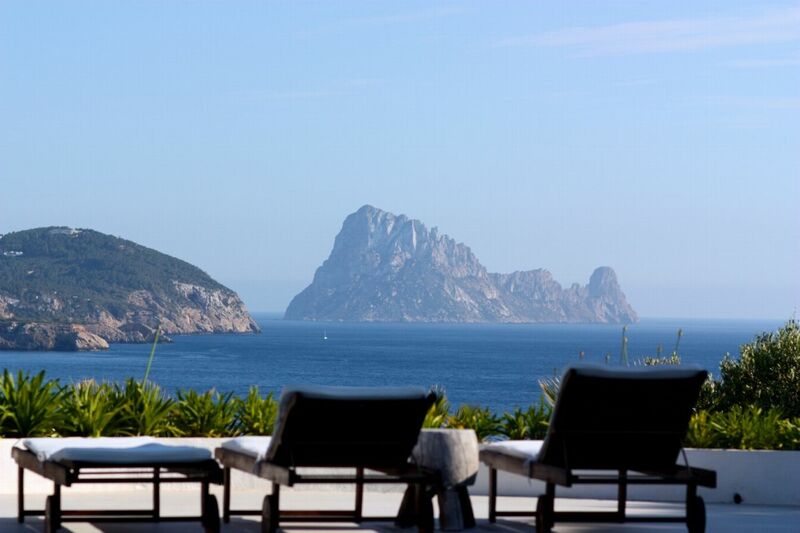 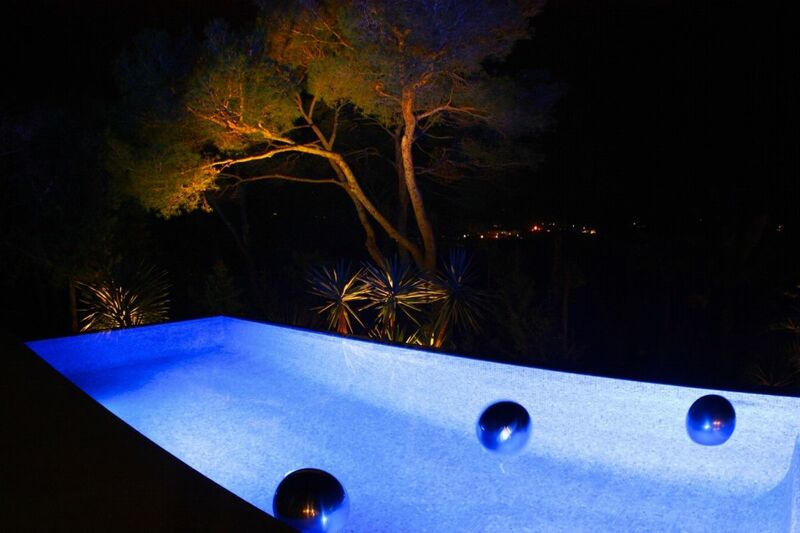 From here, you can gaze across sparkling Balearic sea to the island of Es Vedra as you bathe. 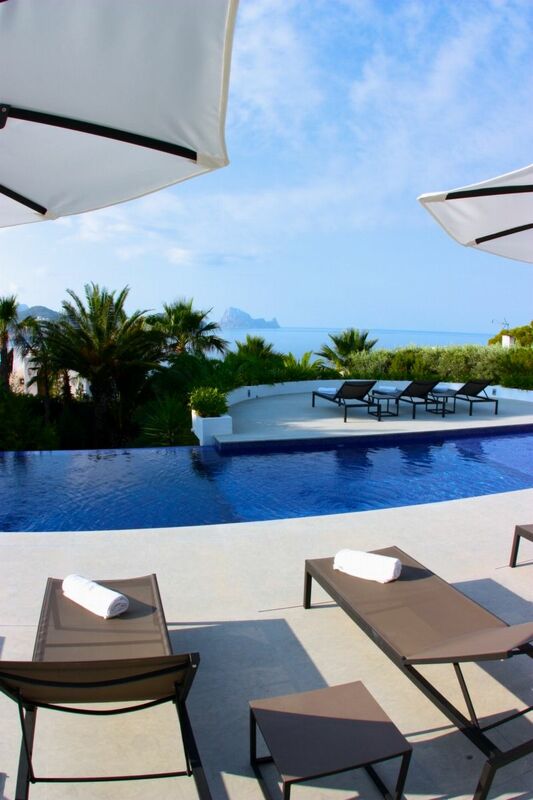 Es Vedra Style is a fantastic Ibizan holiday home for couples or families, in a magnificent location on Ibizaâ€™s west coast. 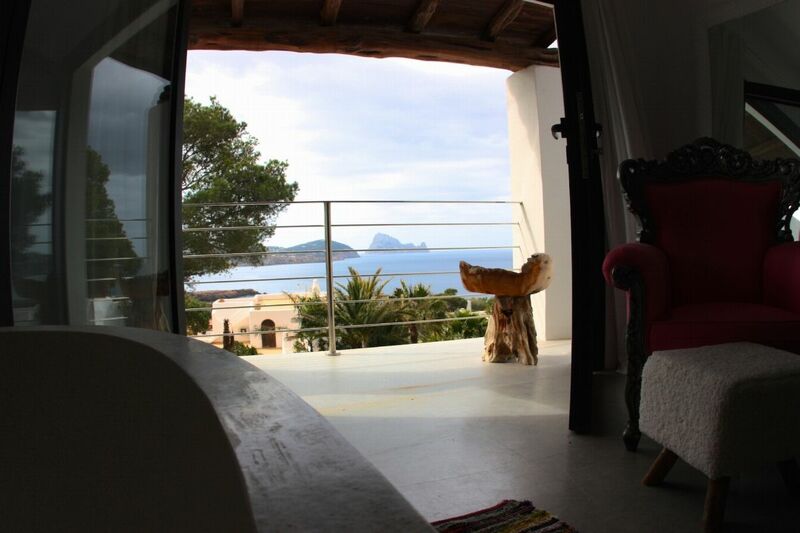 Master Bedroom -	The master bedroom is spacious and located on the first floor with a spectacular view to the sea and Es Vedra. 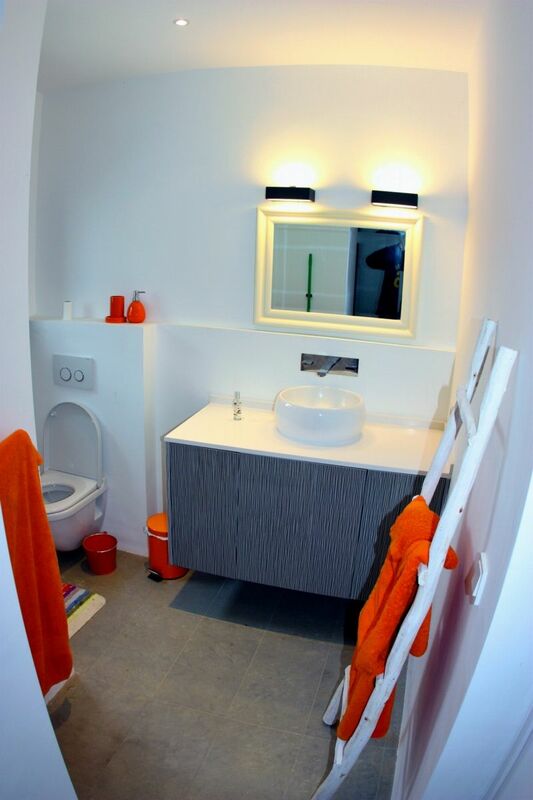 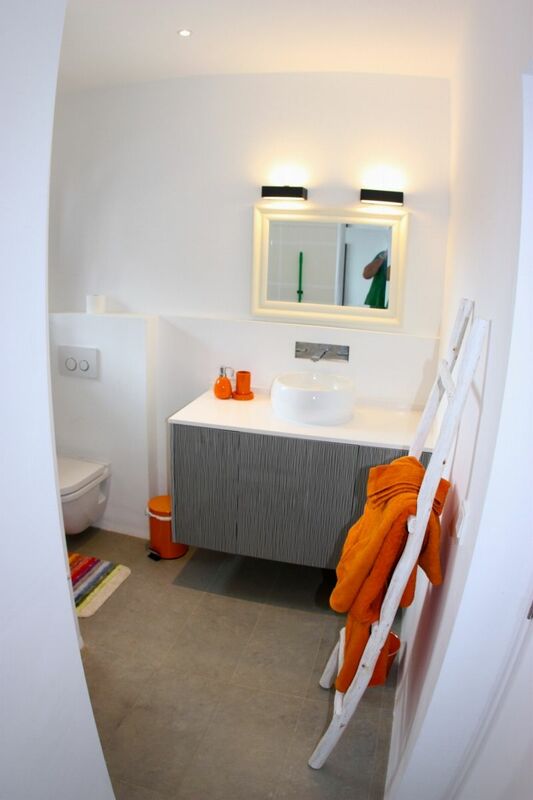 It has a free standing bath tub, a walk in shower, lots of storage and a seperate toilet. 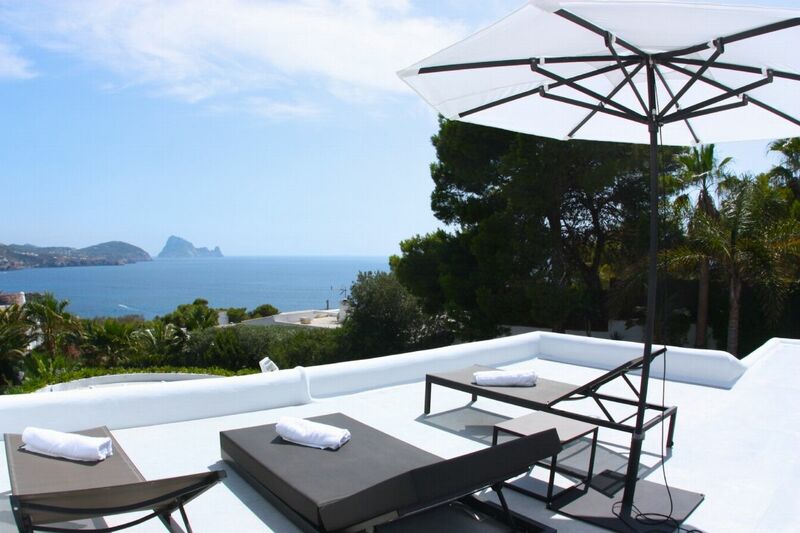 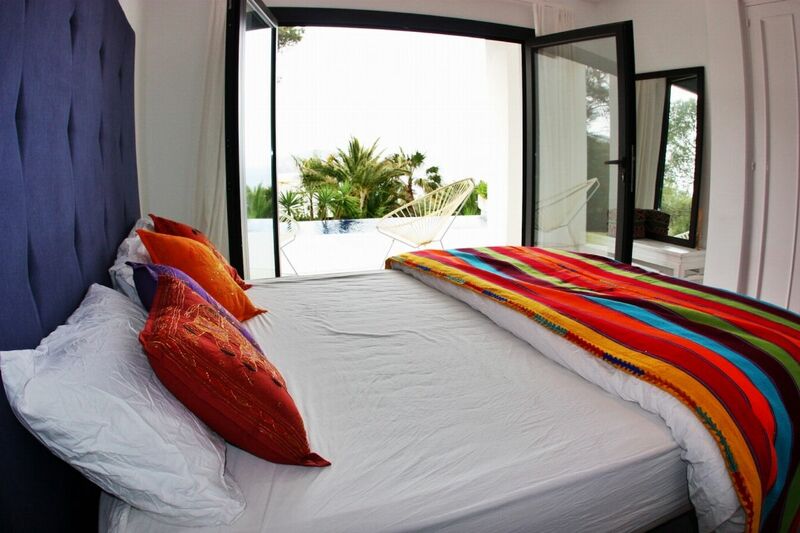 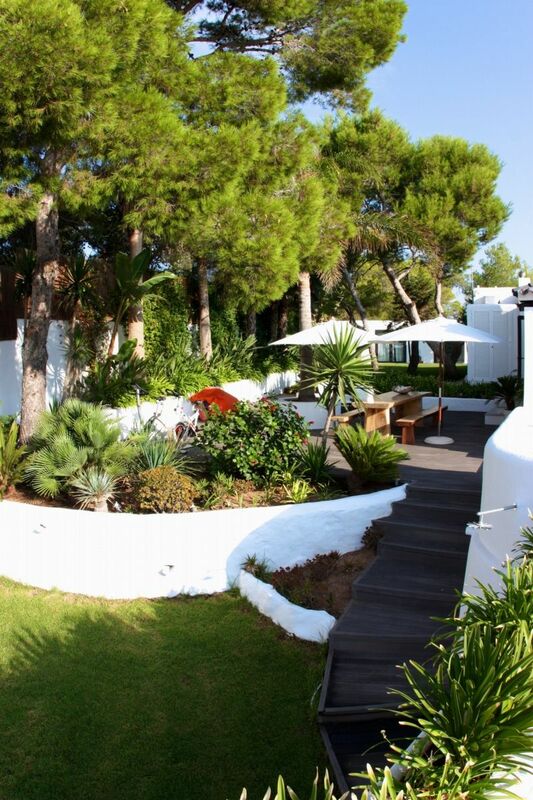 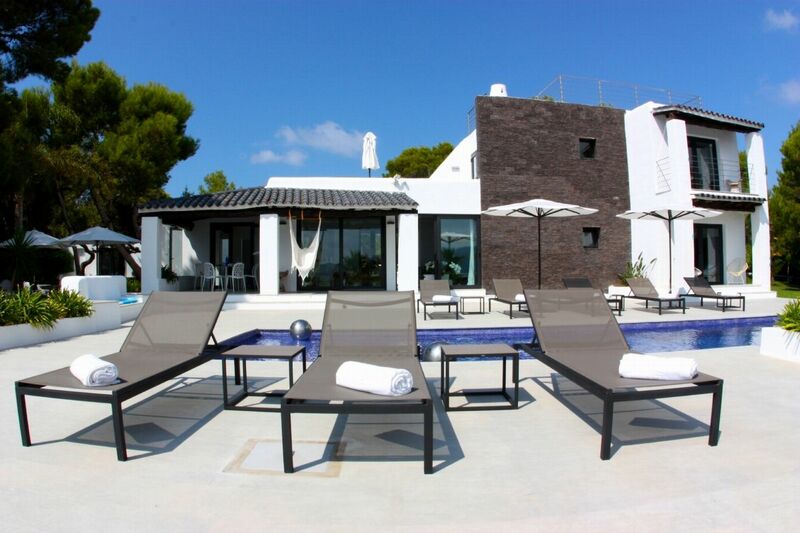 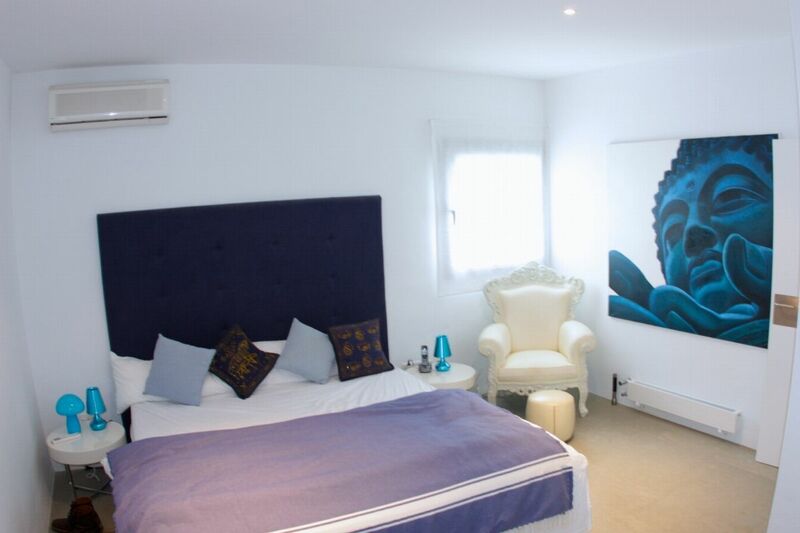 The orange guest room is located on the ground floor with direct access to the pool terrace with views to the sea and Es Vedra. 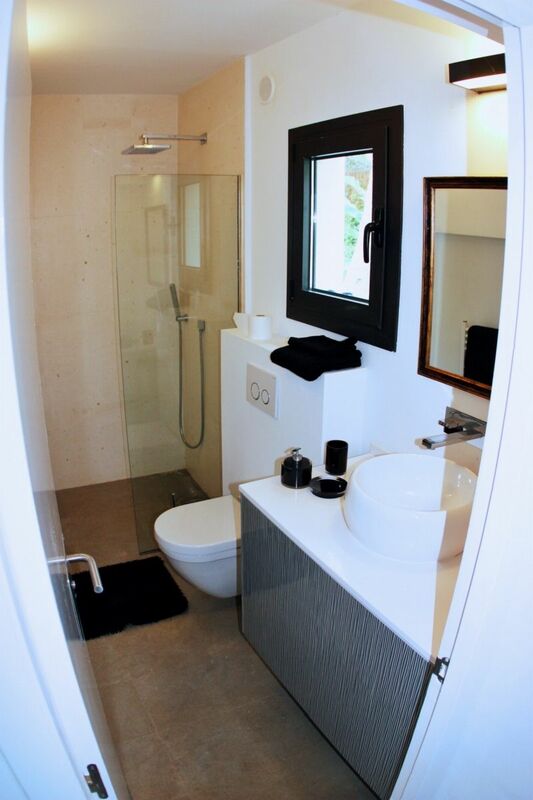 It has an en-suite shower room. 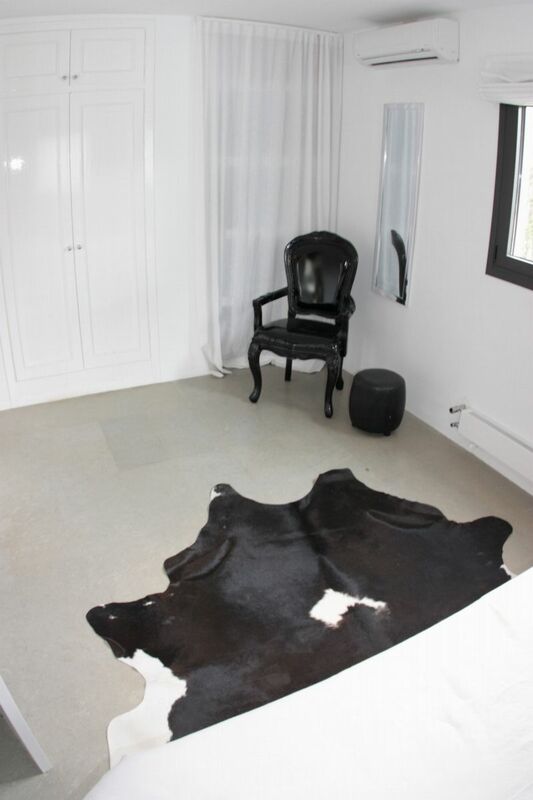 The black guest room is located closest to the kitchen and the living room, next to a study that is equipped with a small office desk and an iMac computer that is available for all guests. 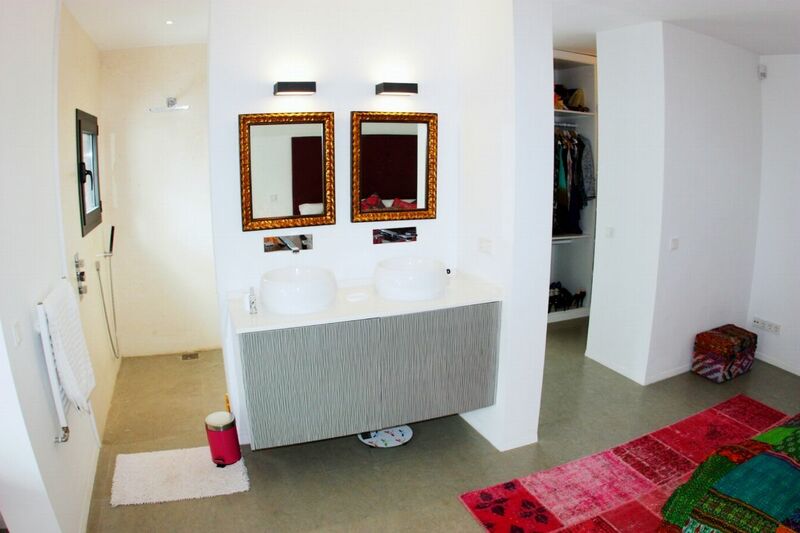 This room also has a spacious bathroom. 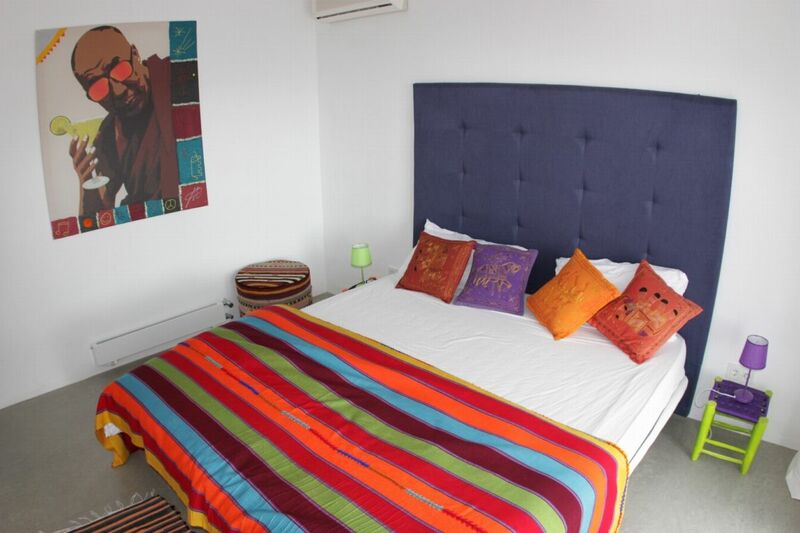 Double guest room located in the guest house with shared bathroom.